Lobuche east is technically difficult and Challenging peak to Climb, It is nearby mt Everest It has two peak one is lobuche far east and another is Loubche east. 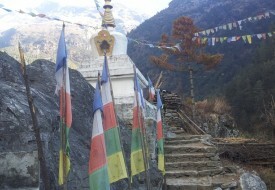 For this peak you can fallow the Everest Base Camp trek and you can Climb this peak as a Side trip. Climbing to any peak requires Physical Fitness and minimum basic Climbing skill. You have excellent view of Mt Everest (8848m) Lotse(8516m), Mt Pomuri, Amadoblem, Nuptse and many others beautiful Mountains.